The 400-meter relay race is a significant race in major track and field events, such as the Olympics, the World Championships and national championships. Relay races are won by the teams that finish the race in the fastest time, but there are other factors involved besides speed. A relay team must be well-coordinated and possess the ability to pass a baton from one member of the team to the next without dropping it while maintaining maximum speed. A full lap around a world-class outdoor track is 400-meters. During this race, each runner runs 100 meters with a baton in-hand and stays in his own lane. Because tracks curve, it looks like the runners in the outside lanes have a significant lead on those running in inside lanes, but each runner runs the same distance throughout the race. The leadoff runners in this race start off in starting blocks. They hold the baton in one hand and take off when they hear the starter's gun. If a runner leaves the starting blocks early, the gun fires a second time to indicate a false start, and the race must start again. 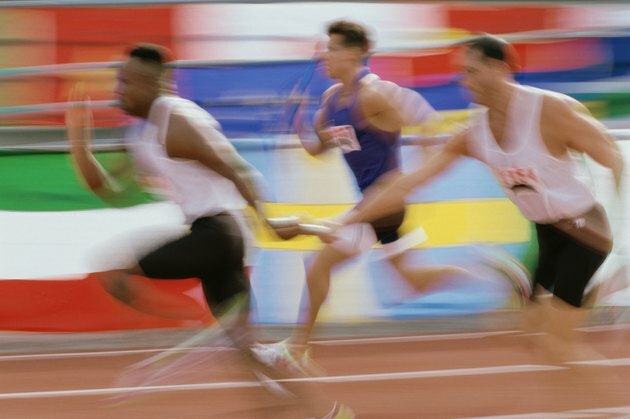 If a runner makes a second false start, his team is disqualified from the race. After each runner runs his leg of the 400-meter relay race, he hands off the baton to his teammate. That teammate must receive the baton within a 20-meter area. If the pass comes before or after that area, the pass is considered illegal, and the team is disqualified. Also, if a runner drops the baton while passing or in the middle of the race, the team is disqualified. The team that completes four separate baton passes legally and successfully and has its last runner cross the finish line first wins the race. Because the 400-meter relay involves such fast and decisive passes, judges sometimes have to review recordings of significant races (Olympics, World Championships, national championships, Olympic Trials) before declaring a winner.